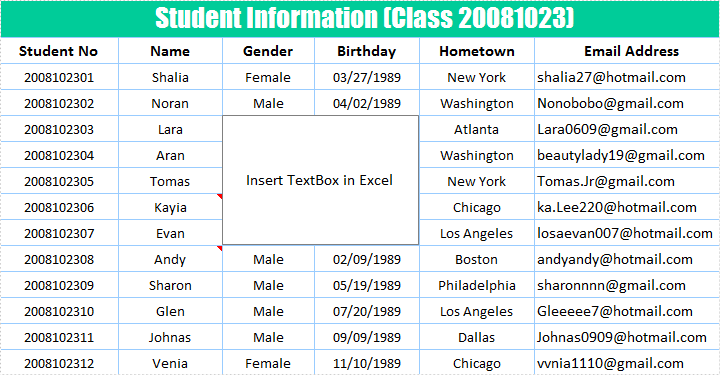 Textbox in Excel is an independent part, which allows users to add and format text in it. It can be quote or abstract about contents in file so that it is often created as sidebar to call readers’ attention. Spire.XLS for .NET, a professional component to manipulate Excel file in .NET applications, enables users to insert textbox in Excel and add contents in it by using C#, VB.NET. Download and install Spire.XLS for .NET and use the following code to insert textbox in Excel. textBox.Text = "Insert TextBox in Excel"